If you’re a guitarist looking for a handy stage gadget that allows you to switch between different settings at the touch of a button, then the Boss LS-2 Line Selector Guitar Effect Pedal is the perfect choice. The LS-2 allows you to change between various effects devices or amplifiers, and you can also switch settings between route input and output signals. Equipped with two line loops and six looping modes, you have a huge array of options to play with to fine tune your sound. The LS-2 projects a clean sound through any amplifier with no clicks or hissing, and noise is kept to an absolute minimum. The inclusion of two line loops and six looping modes means you have a great amount of various applications at your disposal. You can use the LS-2 to separate two different channels, switch between two amps, connect two guitars into one amplifier, or switch between an array of different effects pedals, the choice is virtually limitless! If you’re on stage and want to use six or seven different effects pedals, by combining them with the LS-2 line selector you do not have to manually stomp on and off each individual pedal as the LS-2 lets you do all this with the touch of just one button. The Boss LS-2 can provide a boost to your sound output without added interference and will improve your stage setup immensely. 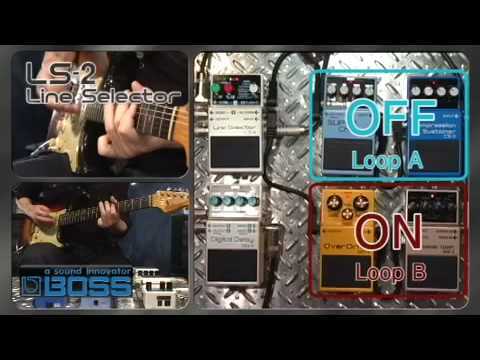 The Boss LS-2 Line Selector Guitar Effect Pedal is one that is not to be ignored, and has a vast capability to help improve your performances especially if you’re heavily into experimenting with different effects and tones.